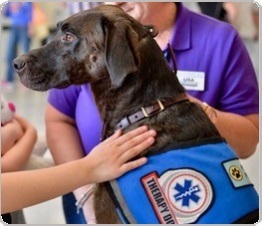 Working Service Dog offers a wide variety of vests, capes and jackets for Therapy Dogs. We carry all size vests to fit a dog from XXS to XXL. All of our vests are of high quality and made in the U.S. 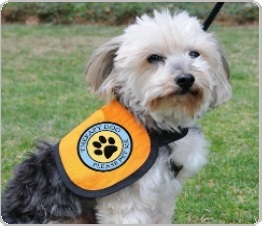 Working Service Dog specializes in vests for small Therapy Dogs. We offer several different style vests in an array of colors. 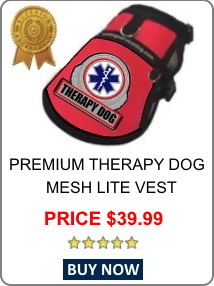 Our most popular small Therapy Dog vest has adjustable straps on both the girth and neck. This vest offers side mesh panels for comfort and cooling, it also includes a large visible metallic Therapy Dog patch sewn to the top of the vest. Also available is a Therapy Dog cape vest. The cape is a loose fitting vest made for comfort and wear ability it includes two smaller patches, one for each side. This vest is perfect for a small dog that will be laying down and is bothered by extra buckles and bulk. For large breed dogs we offer a padded vest with a large highly visible Therapy Dog patch. These vests are offered in several colors and include a pocket to display their Therapy Dog ID Badge. For warmer climates we offer a large mesh Therapy Dog vest made from a high quality mesh material both the padded and mesh vest is made with a built in leash attachment.